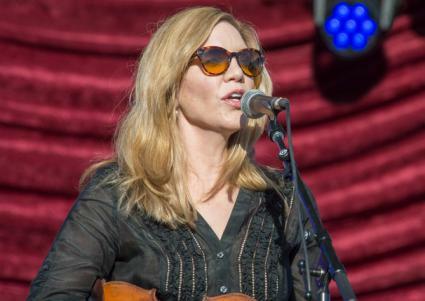 The Alison Krauss biography tells the story of a woman who has quietly built one of the most successful careers in the music industry. Krauss has never achieved the fame of some her music industry counterparts, but she has won more Grammys than any other woman in history and is in third place for number of Grammys overall. Alison Krauss was born July 23, 1971, in Decatur, Illinois. Soon after her birth, her family, who had Mississippi roots, moved to Champaign, Illinois. Music was part of her life almost from the beginning. She demonstrated a talent at an early age, and her parents, musical people themselves, enrolled her in violin lessons by age five. It soon became apparent that Krauss had a natural affinity for the instrument but that classical violin playing was not for her. By age eight, she had moved from classic violin to fiddle playing and found her new calling. Krauss started her own band at age 10 and starting winning talent competitions in her region. She took home the top prize at the Walnut Valley Festival Fiddle Championship at age 13, and that same year, she was named the Most Promising Fiddler in the Midwest by the Society for the Preservation of Bluegrass in America. The Society for the Preservation of Bluegrass in America became instrumental in launching Krauss' career. Starting in her early teens, she became a regular on their festival circuit and at those performances, she met all of the people who would eventually help her release her music and become part of her band. One of the people that Krauss met at those festivals, John Pennell, helped her land her first big break. Pennell had a bluegrass band called Union Station that was in need of a fiddler, and he invited Krauss to join the group. She did, and soon landed a deal with Rounder Records. Her solo debut album on Rounder, called Too Late To Cry, was released when she was 16. Although technically a Krauss solo album, Too Late To Cry featured Union Station as her backing band. Krauss' debut with Union Station came two years later in the form of the release Two Highways. Rounder's contract with Krauss stipulated that her release schedule alternated between Union Station releases and solo records, so her third album was a solo release called I've Got That Old Feeling. This album won Krauss her first Grammy. Her second Grammy came with her next Union Station release, Every Time You Say Goodbye. Another honor for Krauss came in the wake of Every Time You Say Goodbye when she was invited to join the Grand Ole Opry. The Opry hadn't invited a bluegrass musician to join the cast for nearly 30 years, and she was the youngest cast member at the time. One success has lead to another for Krauss over the course of her career, and she is a major star within her genre of music. Her big chance at crossover success came in the form of 2000's O Brother, Where Art Thou soundtrack. The soundtrack, which featured a mix of traditional bluegrass and folk songs and new tracks penned by Krauss and one of her Union Station bandmates, wetn to number one on the Billboard charts. A whole new, mainstream audience was exposed to her music and helped her build crossover success. That success continued in the late 2000s, when she began to collaborate with former Led Zeppelin singer Robert Plant. Krauss and Plant recorded a number of traditional, but lesser known, American folk and bluegrass classics, as well as some new material, for the album Raising Sand. The album won five Grammy awards and went platinum. Krauss and Plant also toured extensively in support of the album release. The two plan to collaborate together on future work. Krauss was briefly married to musician Pat Bergeson. They have one child, Sam, born in 1999. Krauss and Bergeson divorced in 2001.